KGF review: You admire the striking cinematography, and the brown and sepia colours which suffuse the screen in this Yash film. But there’s really nothing more. Beat, punch, slap. Dialogue. Rinse, repeat. 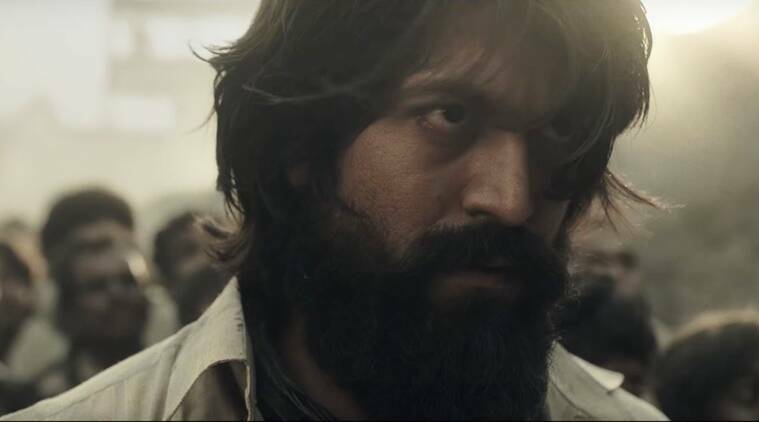 KGF review: This film is fashioned solely as a vehicle for the leading man. KGF stands for the Kolar Gold Fields. Part one of the two-part period actioner (it starts in the early 50s) cuts back and forth from a present-day TV studio where the story of a great hero is being recounted by an old man (Nag), and to the Kolar Gold Fields, where the main action unfolds. But you can safely ignore all these inconvenient details because the film is fashioned solely as a vehicle for the leading man to shake his long locks, glower attractively, and wade into rows and rows of growling rivals with whatever he can lay his hands on: hammers, swords, guns, petrol cans, lighters. Bodies fall, blood sprays out of orifices, and the death count piles up: the film takes its action tag very seriously indeed. The first half pans out like all those scores of films (Nayakan, Deewaar, Parinda) in which poverty-stricken little boys fetch up in Bombay (it wasn’t yet Mumbai) to make something of themselves. Rocky (Yash) learns the hard knocks of life, and claws his way to the attention of the mob bosses who lord over the city, keeping the wires humming between the gold mines and the sheikhs in the Middle East. The second half is when the real film starts. The gold mines are guarded by a family and their armed beasts with bad teeth, who starve and beat the suffering workers into submission. Cruel overlords, human sacrifices, blind old men: there’s something ancient and Biblical about these mines, and the cries of the prisoners, and the violence being wrecked on them. And then Rocky gets going. He is invincible. He can take on hundreds of bad guys without breaking a sweat. He also behaves badly with a young miss (Shetty), just as generations of leading men have, with impunity, and marks her for his own. You wince at that. You admire the striking cinematography, and the brown and sepia colours which suffuse the screen. But there’s really nothing more. Beat, punch, slap. Dialogue. Rinse, repeat. Yash looks capable while slashing and punching, and it helps that he has barely anything to say. The lines may sound better in the original. In Hindi, some of them are howlarious. ‘Bambai mein ek taraf samundar hai, toh doosri taraf Rocky’. And this one, ‘If you think I’m bad, I’m your dad’. Or words to that effect.